In July, in an agreement with the city to renew their liquor license, the owner and manager of Dibbo’s Bar (517 Second St., Hudson, WI) agreed to ban biker colors and one family member from their premises. Hudson Chief of Police, Andrew Smith, has described a series of disturbances caused by 30-40 members of a motorcycle “club” (the Outlaws Motorcycle Club) who “took over Dibbo’s establishment and refused to let patrons come in and kicked other patrons out of Dibbo’s” and blocked police from entering the bar. When the Hudson police finally entered the bar, the manager of the bar, Charles McGee, told officers that he “had lost control of the bar to these club members and was not able to regain control.” Oddly, after all this ruckus, no Hudson or St. Croix County criminal charges were filed, according to City Attorney, Catherine Munkittrick, and District Attorney, Eric Johnson. Following the inciting incident at Dibbo’s, and the resulting agreement with the local police, the next Council meeting received a visit from several members of the Outlaws Motorcycle Club, in full “colors.” Apparently, they had been refused service earlier that day at Dibbo’s and wanted an explanation. “Hudson resident, Dave Anderson, a member of the St. Croix Valley Riders, was the first to come to the podium. He said the rules that were aimed at the Outlaws also had affected his organization, which could no longer hold its meetings at Dibbo’s. ‘We feel this discriminates against all motorcycle riders,’ he said. Anderson was followed by Kim Heinemann, president of the Hudson Area Chamber of Commerce, who gave a rundown of coming Chamber events, including a Girls Night Out bike ride event planned for Sept. 7-8. Heinemann, apparently addressing the motorcyclists ringing the back walls of the council chamber, somewhat nervously added that it was a bicycle ride, and said, ‘Sorry.’ The clarification brought a ripple of laughter from the audience. “Then the Outlaw leader stood to address the council. ‘Jimmy,’ he replied in a gravelly voice when Mayor Breault asked him to identify himself. Jimmy said he had been at Dibbo’s on the night of April 14 when, according to Police Chief Andrew Smith, 30 to 40 members of the Outlaws took control of the nightclub. ‘Nobody got hit. Nobody got hurt,’ Jimmy said. ‘…We didn’t come into town to hurt anybody. We came into town to have some fun.’ The Outlaws leader said the rules the city has forced Dibbo’s to enforce are unconstitutional and that the motorcycle club would challenge them. ‘We will go there. And we will get arrested. And we will challenge you in court and win,’ he said, claiming that a court has ruled that similar regulations imposed on Milwaukee establishments are illegal. Chief Smith stated that other Hudson businesses have complained about motorcycle club members attempting to intimidate them. As in Minnesota along the St. Croix Valley, motorcycle noise and traffic has been a common complaint from Hudson residents and businesses. In other areas, the Outlaws Motorcycle Club are in the news as 16 Michigan and Indiana members were rounded up in mid-August, after a multi-year, multi-authority investigation. Federal authorities and the Fort Wayne Police and South Bend Police Departments were among the agencies assisting in the investigations. Federal authorities claimed that the indictment of 16 members of the Michigan and Indiana Outlaws Motorcycle Club “struck a major blow to the organization’s criminal activity, which . . . includes selling drugs and using violence.” Authorities say the arrests breaks up a gang with chapters in Detroit, Wyandotte, Bay City, Grand Rapids, Indianapolis and Ft. Wayne, Ind. Further away, in Dayton Beach, Tampa, and Jacksonville, Florida, FBI agents raided the Outlaws homes and headquarters. FBI Deputy Director Dan Roberts said that FBI agents confiscated 60 weapons from “gang clubhouses” during the Jacksonville search. 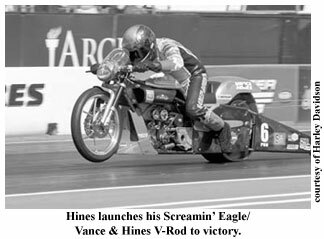 On Aug. 12, Screamin’ Eagle/Vance & Hines Harley-Davidson, Andrew Hines, won his 11th career victory and his first at the Brainerd International Raceway NHRA Nationals. Getting this win happened the 19th time Hines has made it to an NHRA final round. Hines had to beat his teammate, Eddie Krawiec, for this win. Two weeks earlier, Krawiec won his first final in Sonoma, California. After the Brainerd win, Hines has moved into the NHRA POWERade Pro Stock Motorcycle 2nd place position and secured a Countdown position. Krawiec is in 8th place, and is still in contention for a Countdown position. “My guys just made some great tuning calls this weekend,” Hines said after winning his third race this season. “We were a little behind after the first round of qualifying, but we figured it out. We just wanted to qualify and be ready for Sunday. Minnesota witnessed history as Ricky Carmichael whipped up at the Millville Spring Creek Motocross Park AMA event on August 12th. Carmichael won both motos and finally got his 150th career victory. Kawasaki rider, James Stewart, was out due to a bum knee, which cleared the field for Carmichael, who has been hampered in his 150-victory quest by Stewart. Grant Langston (Yamaha) took second place in both motos. KTM’s Mike Alessi finished third overall (4/3). Carmichael officially retired from two-wheel competition after getting #150. However, he will be riding with the USA team at the Motocross des Nations later this year. Then, he is moving on to trying his hands at NASCAR racing. With Carmichael gone, Andrew Short (Honda) and Timmy Ferry (Kawasaki) are left to battle out the season’s point’s lead, currently tied at 311 points apiece. Grant Langstonis in third place, trailing by 11 points. motocross history by winning every event he entered (24) on the way to his third 250cc championship. Carmichael won 15 AMA National Championships, and 5 AMA Supercross Championships. Carmichael, Bob Hannah and Jeremy McGrath are the only riders to ever win three straight championships. Now that 11 out of the 18 2007 MotoGP races are in the books, last year’s champ, Nicky Hayden, is clinging to 10th place in the championship points. Is it possible that no past champ has done this badly in defending his title? Michelin must be wishing a bad case of laryngitis upon Valentino Rossi, since he doesn’t seem to be running out of complaints about how poorly the tire manufacturer’s products worked at Laguna Seca. Rossi is, essentially, claiming that Bridgestone beat Michelin in California, more than any other factor in the race results. Bridgestone did take the top three places at Laguna Seca. Rossi finished a disappointing fourth (30+ seconds back of the leader). Michelin is asking for a “spec tire rule” to level the traction field. MMM believes it would be better for racing and street riding if the best tires are allowed to develop, regardless of who makes them. The Italian government is after MotoGP hero, Valentino Rossi, for tax evasion. Apparently, Rossi hasn’t paid a tax pittance on his 60 million Euro earnings for the last six years. Of course, Rossi and his management company reside in London, but the report stated that he “resided in London, but not domiciled there”. The Italian government thinks Rossi should be a taxpaying Italian citizen. He’s not the first rich rider to evade national taxes. Troy Bayliss lives in Monaco. So did Michael Doohan while he was the 500cc king. Neil Hodgson and James Toseland hide out on the Isle of Man. If these guys evade national taxes, how do they get away with racing at home without going to jail after popping the champagne cork? Honda’s Miguel DuHamel was injured as a result of a crash at Road Atlanta. He has been released from a Georgia hospital and is back in Montreal, recuperating. He suffered a broken rib, a punctured right lung, and a collapsed left lung, a lacerated liver, and sprains to both ankles and knees. He will begin physical therapy soon, but he’s currently on crutches. He was reported to be alert and able to converse with emergency personnel. However, he was hospitalized for tests. At the time of his crash, he was third in points for the 2007 AMA Superbike championship. DuHamel is one of the winningest riders in AMA road racing history, and has always been a fan favorite. He has a long affiliation with the American Honda race team. DuHamel recently participated as a wild card rider at the Laguna Seca MotoGP event. The most successful BMW of all times.” July 27, 2007 BMW celebrated rolling the 100,000th 1200 GS down the conveyor belt. Including the Adventure, the 1200 GS is the most popular BMW ever designed (84,373 units have been the classic GS and 15,627 units were Adventures). “No other BMW motorcycle has ever been built so often within such a short space of time.” To top off the celebration, Motorcyclist’s September issue named the BMW R 1200 GS Adventure the “Best Adventure Bike” for the third consecutive year. Triumph’s big 1050cc triple was spawned in a 1990’s smaller version and is overdue for updating. According to European rumor, the Brit company is redesigning the big triple. Part of the motivation is due to the hope that WSB rules will allow a 1100cc triple in the near future. The new engine is expected to find a home in the Speed Triple, Tiger, and the Sprint ST within a couple of years. MV Agusta has sold its off-road Husqvarna division to BMW. With this move, BMW has expanded its motorcycle brand into serious off-road machines and supermotos. MV Agusta Group’s President, Claudio Castiglioni, and Dr. Herbert Diess, General Director of BMW Motorrad, finalized the agreement on July 19, 2007. The Return of the CB750? Motorcycle News of England has reported that Honda might be producing a remake of the 1969 CB750. Not just a few magazines have called this motorcycle one of the most important bikes of the 20th Century. If you are one of the thousands of riders who owned one of the original CB750s, maybe you’ll get “when I was young” flashbacks from owning another? Nostalgia; that crazy emotion that makes obsolete technology seem new and interesting. Senility; the ailment that keeps our economy moving . . . backward. He was quoted as having felt “excruciating pain,” but failed to notice that he’d lost his right leg in the crash until he attempted to stop at the next intersection. He and the leg were taken to a hospital, but the leg was too damaged to reattach. And I thought riding with a broken finger was macho? Get Your Harley-Davidson 105th Anniversary Tickets Now! Tickets are on sale for the Harley-Davidson 105th Anniversary party taking place on August 28-31, 2008, in Milwaukee. The official Harley-Davidson 105th Anniversary Celebration ticket package costs $60 and includes “a Signature 105th folio, laminated event ticket good for a two-day entry to the Summerfest, grounds and a one-time entry to Discovery World’s special Harley-Davidson exhibit, an event guide, a Signature 105th Anniversary copper wristband, a 105th Anniversary flag, and an American flag.” For more information and to order tickets, go to www.harley-davidson.com/105th. Mat Mladin is hoping to win his 60th AMA Superbike race in mid-August at the Virginia International Raceway’s AMA Superbike Championship in Alton, Va. Mladin passed Duhamel as all-time AMA Superbike win leader in 2004. Australian Yoshimura Suzuki’s Mladin, the six-time AMA Superbike Champion, is in serious contention for a 7th AMA Superbike championship. He is 17 points behind series leader, defending champ, Ben Spies. Harley Davidson 2006-2007 XL1200L; 2007 XL1200N: The exhaust manifold/header/muffler/tail pipe can come in direct contact with the rider’s leg, which could lead to the possibility of burn injury to the rider. Dealers will add an exhaust shield to cover the exhaust. Harley Davidson 2006 VRSCR: Exhaust manifold/header/muffler/tail pipe can come in direct contact with the rider’s leg, which could lead to the possibility of burn injury to the rider. Dealers will add a new heat shield, P/N 66820-06 to cover the exhaust. 2007 Kawasaki KLX250s: Spot weld for the rear shock top mount can fail which could result in a crash. Dealers will replace the motorcycle. 2008 Kawasaki KLR650: Sidestand can drop while underway because of failure of the retaining pin on the frame. Dealers will buy back the motorcycle. Moto Guzzi 2003-2004 EV: Lower steering fork yoke could form a crack around the lower fork bearing, causing loss of steering control. Moto Guzzi 2006-2007 Griso: Poor quality fuel pump hose swells up and leaks fuel pressure, causing loss of fuel and engine stalling. Piaggio 2006-2007 Vespa GTS: Leaking graphite exhaust header pipe gasket directs hot exhaust gasses onto the rear brake hose, causing loss of brakes. Dealers will replace the header, pipe, clamp and gasket. If you’re plagued with aches and pains after an afternoon of motorcycling, consider an old Aussie Aboriginal remedy, “emu oil.” Emu oil made it into the news when Paula Radcliffe, the winner of the 2003 Flora London Marathon, claimed that it was her cure for injuries she received from that race. Now, Steve Plater, AIM Yamaha Racing’s hot new star rider, the Centenary Isle of Man races’ “best newcomer,” says his brand of emu goo “is the best there is!” and adds that he “would recommend it to anyone who spends time on a bike!’ Aboriginal medicine has assigned healing properties to Emu Oil for centuries. Several scientific studies have supported that claim, resulting in the registration of the oil as an “anti-inflammatory.” Supposedly, emu oil’s medical properties are provided by its unique fatty acid composition. Promoters claim that the oil is rich in the nutrients needed to help maintain and repair the body’s cells and fuel the recovery process. Go squeeze an emu on your busted up parts until you feel better.